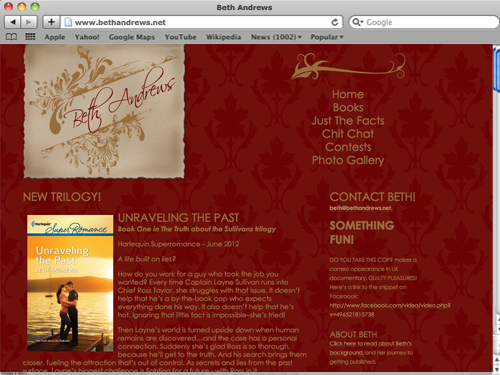 Romance author Beth Andrew’s web site utilizes WordPress as a content management system and a custom theme based on the jewel tones Beth finds appealing. This custom theme takes advantage of several plug-ins including: Sidebar Widget, Democracy Polling, Event Calendar Widget, WP-ShortStat and a Lightbox photo gallery. Beth also uses MailChimp for management of her custom designed quarterly e-newsletter.